Once you have visited several cities in Western Europe — you start to notice a certain “Europeaness” about the places you go. Despite that the city will have it’s own language and it’s own culture, there is a distinct unifying quality that makes it similar to other European cities. Madrid is no exception to this rule. However, unlike most major European cities — there aren’t many main landmarks here which attract visitors. The architecture of the city is beautiful and there are some fantastic sights such as the Palacio Royal (Royal Palace). But, what seems to be the big draw for travelers is the attitude of the city which is distinctly and completely Spanish. The rhythm of Madrid is much slower and more relaxed than anywhere else I have ever been. People wake up at 10 or 11 in the morning and have a cafe con leche and churros with a cup of bitter-sweet chocolate for breakfast. Lunch is about 2 p.m. and is no mere meal. It is a long feast which might be enjoyed over two hours with tapas and Tinto de Verano (red wine and Sprite) . Even business professionals are given two hours for lunch every day. Then dinner is at 10:30 and can go until midnight. 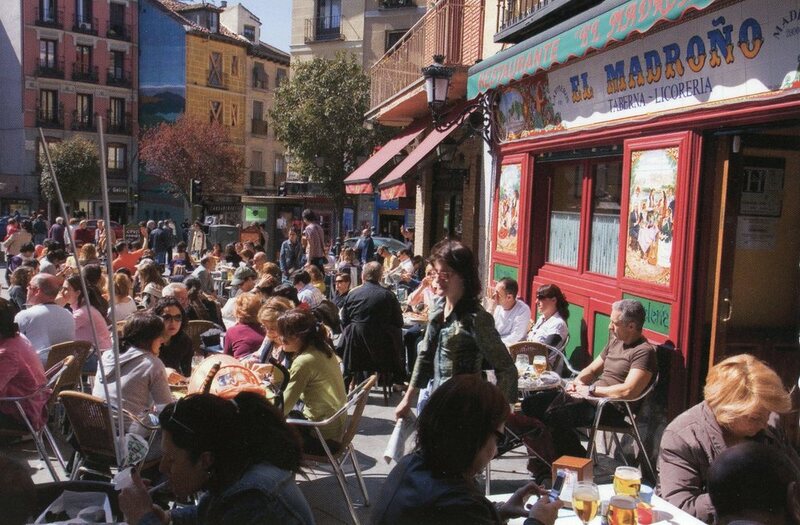 There are plazas all over Madrid where bars have outdoor seating and customers can sit, enjoy their food and drink until 2 a.m. Even people who aren’t sitting at the tables and chairs provided by the bars may still enjoy the plaza by buying cerveza from vendors in the square and sit on the ground in small groups to chat and relax once the sun has begun to set. The locals, the tourists and the ex-pats all co-exist relatively well in this diverse place. Everyone seems to have a dog and it’s not uncommon to see unleashed canines following behind their masters or playing with other canines on small brick roads. Flamboyant gay men walk about — dressed to the nines. 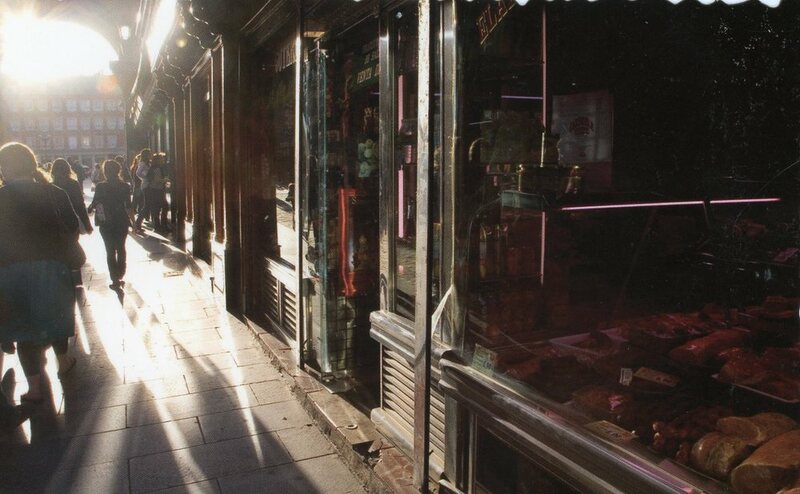 Middle-aged prostitutes stand on street corners smoking cigarettes looking tired and weather worn. Overall, it’s a unique yet unremarkable city. It’s not a place I have found myself falling in love with (unlike Edinburgh or Nice). I don’t feel the need to go unearth any secret amazing bars or monuments. Yet, I appreciate why this place would be an ideal city to live in for a few years. The idea of living in one of the beautiful old style apartments with their balconies and French windows in a city that doesn’t wind down until 4 a.m. is a pretty enticing thought. Madrid provides a vivid and laid back charm that is impossible not to appreciate. These are actual postcards I picked up in a small shop in Madrid two years ago. While I do favor picture postcards, these are unique in my collection as they feature the atmosphere and life of Madrid instead of a grand building or landscape. That is what made these the perfect souvenir. Madrid is not about larger than life architecture and must-see tourist attractions but about the attitude of the city and its people. Spain itself is very laid back and buzzing with energy, yet it’s particular history both during WWII and the Franco dictatorship afterwards has made it seem slightly more isolated than other countries in Europe. For instance, Madrid is filled with ex-pats, yet you will be more hard pressed in this European capitol to find locals that speak another language compared to it’s neighboring nations. History is contentious here and you are reminded that while the rest of the world was fighting each other during WWII, Spain was undergoing a brutal civil war which has never been fully reconciled among its citizens. All of this makes Madrid a particularly different type of city to visit. It is one of experience, rather than sights and a history full of debate rather than certainty. But, one thing is for sure, you will not find any other place like it. After three relaxing days in Madrid, I headed north to a small university town called Salamanca. The town had been recommended as a good place to go for a weekend visit but other than it being a university town — I knew very little about the area. After nearly three hours on the train ride through the arid Spanish landscape — I arrived at the small Spanish town and was immediately taken aback. While there is a more modern area of Salamanca; it all surrounds the historic part of town which features two sprawling medieval cathedrals, ancient walls and many old orange and white buildings. I later found that this is one reason why Salamanca is considered one of the great Renaissance cities in Europe. I also learned that the university in Salamanca was no mere institution. The Universidad de Salamanca has been in existence since the 1200s and is often compared to Oxford. Much like it’s English rival, the Universidad de Salamanca is spread throughout the historic section of the city. In fact whatever ancient buildings there are — a part from the two cathedrals — usually are apart of the university itself. Obviously the primary focus on my trip was to see both of the cathedrals in Salamanca. I’ve been to my share of cathedrals at this point after going through a lot of Western Europe including Notre Dame, and St. Peter’s in Rome. These were obviously not nearly as grand, however they were much more accessible. The two cathedrals are the New Cathedral, which was built in the 16th century, and the Old Cathedral, built in the 12th century. Both cathedrals (they are so close they only have a square separating them) are both fantastic vantage points to see the whole city from. At the center of historic Salamanca is their own famous Plaza Mayor, the main square. This square dates back to the early 1700s and is surrounded by archways that feature medallions of important people in Spain’s history — mostly royalty. However, there is a controversial portrait among them — that of Francisco Franco. As the Plaza is so inspiring (it’s perhaps the most famous square in all of Spain) it was a major contrast to go to a gypsy punk concert (think Gogol Bordello) on my last night. The concert was one of many that were taking place during a cultural festival that weekend. As discussed in my last blog post…the Spanish do not go to bed until the wee hours of the morning. So it was amazing seeing senior citizens as well as university students in this vibrant crowd dancing to the music. Especially when the band got the crowd involved by having them chant “F*** you MTV” as part of one of their songs. Let’s just say I now have two very different but great memories of the Plaza Mayor. The town of Salamanca is not huge, and is easily seen in two days. So, there are two things I did to get outside of the area…the first is paddle boating. There is a river that runs alongside the old area called Rio Tormes and it has an ancient Roman bridge going over it. Alongside the river you can rent a paddle boat from a relaxed Spanish guy who looks like he is someone who longed to live the life of a beach bum. He and his dalmatian, that was very uninterested in strangers, were happy to rent me a paddle boat for 10 euros. Definitely worth going up and down the river looking at the city, especially when it’s hot! The second thing I did was go to the local Salamanca market. I was really excited about this in particular because I figured it would be like most of the European markets I have been to where there is fresh produce and maybe a few knick-knacks to pick up. Boy…was I wrong. A fifteen minute drive outside the city and there it was. A really bad flea market. If I was after really cheap sunglasses and underwear made in China (that’s how they were being advertised) then I would have been in the right place. Unfortunately, that wasn’t what I was after. So for anyone going to Salamanca, I don’t recommend the market outside the city. Overall, Salamanca was a fantastic weekend getaway and I highly recommend it to anyone who is looking for somewhere to go for a couple of days in Spain.